The Wheel of Fortune is the tenth Major Arcana card. 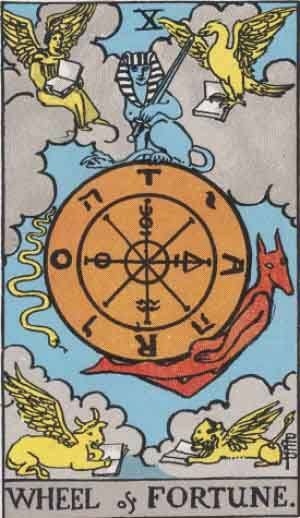 Unlike the previous cards, it’s harder to take an educated guess at what The Wheel of Fortune means, as there is no central figurein the illustration. You would be right, however, for assuming this card deals with Luck. The Wheel of Fortune represents fate and destiny, and also development and change. Past – The Wheel of Fortune in the Past position represents a big change in your past that is currently affecting your life. These are usually big changes, like moving home or starting a new job, or relationship. Whatever the change, it’s having an effect now. Take into account other cards in your spread to interpret the changes. Any swords cards? It could be a past time of violence. Present – The Wheel of Fortune in the present position represents a current ongoing change. You could have felt lost for a while and pondered on something (like The Hermit. This is the journey of The Fool you know! ), and you’ve just recently found the answer to it. It’s a good card to see in the present position, as it means a good change is currently ongoing, and you’ll be able to see immediate effects of it. Future – The Wheel of Fortune in the future position means you’re setting yourself up for a bit change in your life. The card is generally positive, so works well in the future position. It’s something to look forward to at least. Consider what was in your mind when you decided to do this reading, and then consider what is a good outcome of that particular scenario. The Wheel of Fortune in the future position likely represents that. Work / Education – The Wheel of Fortune in regards to work or education means that you’re after a radical change. You’ve been bored for too long and want something new. A whole new career maybe? You just don’t have the passion any more. Another good example would be that you’ve just finished a course, but you’ve lost the heart to continue in this field. Romance – The Wheel of Fortune is not a good card in regards to romance. It might not be the right time to pursue any romantic relationships right now if you have your eye set on somebody. Speed dating might work. Any existing relationships might go through a rough spot, but it won’t be anything major. Friends – The Wheel of Fortune in regards to friendship means that you might get in with a new group of friends. You might know a certain friend better too, or if you’re in two circles of friends, you might expand and merge into another circle. Money – The Wheel of Fortune in regards to wealth is a good sign. If you’re currently having a hard time, The Wheel of Fortune means things will brighten up for you. It’s all about change. Not loose change, but change in your current state. be sensible and manage your money, if even you have a lot of it. Health – The Wheel of Fortune could mean a few things in regards to health. Things are going to change; if this card was brought up in the place of health. You could recover, if you’re ill, but just watch out and take care of yourself if you’re fit and healthy. Spirituality and Mentality – The Wheel of Fortune in spirituality suggests that you might have a sudden change. You might read a new piece of religious or esoteric literature and get inspired to create something. The Wheel of Fortune is just that; a wheel, so its a good time to think about the cyclical nature of reality and how events can come back on themselves. You may have been experiencing a lack of control in your life recently, like the universe is working against you. Look at address and imbalances in your life. Too much time, or not enough time working? Look to address the lack of ongoing balance. Also, remember that sometimes we are just struck with bad luck. Life isn’t a series of positive events; we have to learn to deal with the negative things which occur in a healthy way. As a Yes or No question: Yes! We’ve selected live tarot readers to give you a FREE 3 Minute interpretation of The Wheel of Fortune! Scroll through them below and pick your favorite one.